In your prayers please remember Juan Lopez Sandoval who died on Friday, April 6, 2018. He is the father of Janie Quesada the secretary of Holy Cross, Ruben Sandoval Class of 1970, Edgar Sandoval Class of 1975 and John Roel Sandoval Class of 1976. In your prayers please remember Ethel Villarreal Martinez who died on Sunday, April 1, 2018. She is the Mother of Mark Martinez Class of 1976, Grandmother of Ray Martinez, Jr. Class of 1999 and Mark Martinez Jr. Class of 2009. Belatedly, in your prayers please remember Amando Herrera who died on Thursday, March 29, 2018. Amando is a Holy Cross Alumnus in the Class of 1987. The Mass of Christian Burial was celebrated on Tuesday, April 10, 2018. In your prayers please remember Lee Talamantez who died on Thursday, March 31, 2018. Lee is a member of the Class of 1987. In your prayers please remember Leonora Ortiz Zamarron Rodriguez in your prayers. She is the mother of Cruz Zamarron Class of 1972, Ignacio Zamarrom Class of 1975, Roger Zamarron Class of 1977 and James Zamarron Class of 1979. 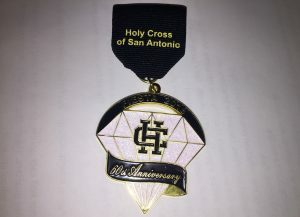 Holy Cross fiesta medals are now on sale at the school front office, or Contact Mrs. Sophia Urias @ 210-364-7957 to purchase one. You can also find her table set up in the breezeway after school on most days. Buy yours before they’re all gone! In your prayers please remember Paul A. Charles, who died on Friday, March 16, 2018. Paul A. Charles is the father of Paul S. Charles Class of 1969 and Mark Anthony Charles Class of 1974. Paul is also the uncle of Osvaldo Constantino Vela of 1982, Frank Flores of 1985 (Deceased), Marcelo Garcia of 1986, Fernando Flores of 1994 and great uncle of Leah Flores-Calderon of 2011 and Adriana Flores-Calderon of 2012. In your prayers please remember Carmen G. Barbosa who died on April 4, 2018. She is the mother of Armando Barbosa Class of 1973 and the great-aunt of Maya Marie Screaton Class of 2018. Beatrice S. Charles, of San Antonio, TX passed away on Tuesday, February 27, 2018 at the age of 86. Beatrice was born to parents Pedro and Maria Sandoval on March 21, 1931 in Austin, TX. She grew up as the youngest of seven and graduated Jefferson High School in San Antonio. In 1950, she married Paul A. Charles. For 29 years she worked at the grand Joske’s department store and was the manager at the gift wrapping department. She spent most of her free time going to the cinema. Beatrice is survived by her loving husband Paul A. Charles, here three sons, Paul, Mark, and Gabriel; her nephew, Roger; her brother, “Chico” Sandoval; four grandchildren; and four great-grandchildren. She is preceded in death by her parents, Pedro and Maria Sandoval; her sister, Justa and Etelvina; and her brother, Vicente, Jesse and Pedro, Jr.; nieces and nephews.